Life with a PowerPC Mac mini has been great! It's given me complete freedom to use the latest and greatest Mac OS X software. And it's allowed me to dedicate my beige G3 to OS 9, which I still need to use now and then. On my Macs, it seems that fewer old programs run successfully in Classic with each new incarnation of OS X. Since I have quite a bit of data on external SCSI drives and since my only scanner is SCSI, I also can't quite do without an external SCSI bus on at least one Mac. When both Macs are running and networked, the castors on my office chair can get a real workout, rolling back and forth between the OS 9 and OS X screens. Sure, it's complicated, but ethernet file transfers between two Macs are far less tedious than booting and rebooting between two operating systems on the same Mac (see Switching Between OS 9 and OS X Definitely Beats Switching to Windows). If things weren't complicated enough, a friend called one evening with an offer I couldn't refuse. He was getting rid of his Power Mac G4 and wanted to give it to me. I knew this Mac. I'd spent more than a few hours trying to fix mysterious recurring problems it had. I knew it had the Yikes! mother board with the official Apple 350 MHz processor "downgrade". That meant three vacant PCI slots. I had a spare Orange Micro (now defunct) SCSI card and could transfer the auxiliary ATI Rage 128 video card and 128 GB hard drive from my beige G3, effectively replacing it with a much faster, more versatile OS 9 Mac. As a bonus, I could keep a bootable backup clone of the mini's Tiger disk on one of the G4's partitions. I accepted his offer with much gratitude. Due to the problems this G4 had from the time it was new, it was on its second replacement hard drive. Both replacements were installed by a PC repair shop. I was fairly certain the drives were never at fault. The first two drives (with all of their data) were not returned to the owner, so I couldn't verify my suspicions. The symptoms were generic or entirely missing icons, applications quitting unexpectedly, system lockups, and data loss and corruption. Disk First Aid could find no problems with the current hard drive, and Virex detected no malware. I'd been unable to look inside this Mac due to its cramped location crowded under a desk in a tiny room. The initial fix I tried for my friend was to trash the Finder prefs, then completely rebuild the OS 8.6 desktop files by first using ResEdit to make them visible, then putting them in the Trash and rebooting. Just holding down the Command and Option keys at startup doesn't do a complete rebuild job, and I sensed major corruption here. I explained the necessity of periodically rebuilding the desktop to the owner. It was something he'd never done. Unfortunately, even this extreme version of a desktop rebuild didn't help. Next, I put the System and Finder files in the Trash and then rebooted from the install disk. I reinstalled the OS, and everything seemed to work fine. That summer, the owner reported that the G4 worked fine for a while after I left - but then the problems began to reemerge. When I got the G4 home, I booted it, and after using AppleWorks for a few minutes, the application quit unexpectedly. I shut down the G4 and opened the case. In the memory slots were one official Apple 64 MB DIMM and one seedy-looking aftermarket 128 MB DIMM with a handwritten paper label. I removed these and set them aside. Then I installed the three DIMMs from my G3. This was 512 MB of good memory, plus I added an additional good 128 MB DIMM, filling all four of the G4's slots. Magically, the unexpected quits ceased to be a problem. So far the system had not hung on me, but it's important to note that it was still winter here in the Northeast, and we keep it pretty cool in the house. This is another important clue. Did you catch the first two? Next, I installed the SCSI and video cards and moved the 128 GB drive from the G3 to the G4. I had to reinstall OS 9.2.2 to get the G4-specific System parts. I verified that the SCSI card worked without drivers and decided that the G3 had officially been replaced. It was a little like saying good-bye to a good old slow-to-react friend. I've overclocked almost every older Mac I've ever owned and used regularly. It's a great and often simple way to get some free or inexpensive speed for an older computer. There are risks, but they are small if you don't want to run a processor at its absolute red line. I knew the Yikes! mother board was designed for faster speeds. The 350 MHz processor should accept a mild (but noticeable) up-clock to 400 MHz. My first stop was Reader How to: Overclocking the Yikes! G4 on Accelerate Your Mac, to see who had gone into the Yikes! overclocking arena before me. The instructions posted there assumed that the reader had the original faster Yikes! 400 MHz G4 that was downgraded to my model, but since that was the processor speed I was after, the principle was the same. I would just need an additional jumper to add to the #3 slot in the jumper block; this came from a spare G3 jumper block I had. Individual small jumpers can also be used and will eliminate the need to modify the jumper block unit. After replacing the block, the G4 booted and reported its new speed. I opened a few applications, then ran the iTunes Visualizer to tax the processor a little. It worked for a few minutes, and then the system locked up. I added a processor fan to the heatsink and tried again. This should have made a difference, but it didn't. The system froze a second time. I pulled the processor's heatsink to check the contact area and made a discovery that may have you considering a peek inside your G4. The PowerPC processors in Macintosh computers have a central raised heat-transfer area. To ensure that the heatsink sits flat on this area, a square pad with a square hole in the center is applied to the processor. This prevents the heatsink from levering away from the transfer area. On this particular processor, the pad is laminated with a clear plastic layer to prevent shorts from occurring. This layer was off center and covered approximately 1/16" of one edge of the heat transfer area. This meant that the heatsink was propped up off the processor, contacting it only along one edge of the transfer area. In short, the heatsink might as well not have been there. In fact, there would have been better air flow around the processor if it wasn't. I reasoned that trying to pull the pad off to reposition it might distort it or cause it to come apart. My solution was to carefully trim the overlapping plastic layer away from the transfer area with an X-acto knife. With the heatsink now sitting flat on the processor with some fresh heat transfer paste, the G4 is running cool and stable with a peak processor temperature of 32°C/89.6°F, according to Temperature Monitor. An additional experiment to clock the processor to 450 MHz produced a normal boot tone followed by no drive activity and a black screen. If your G4 is running fine, I don't recommend bothering to check for this defect. Apple uses a heat transfer pad between the heatsink and processor. As these pads get older, they can harden. 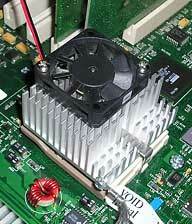 Moving the heatsink can realign the perfectly mated surfaces and reduce the efficiency of the heat transfer. I routinely remove these pads and substitute a thin coat of heat transfer paste (a.k.a. 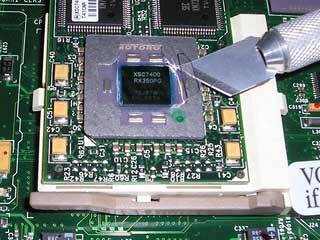 thermal grease). This fills irregularities and puts the two surfaces together without a thick inefficient go-between. Did this G4 suffer a chance manufacturing defect, or was this defect repeated in an entire production run? If anyone else encounters this problem, please feel free to drop me a line.